To promote the interests of the Ostrich Processing industry in South Africa. To approach Government in co-operation with the South African Ostrich Business Chamber, to coordinate any matter directly or indirectly affecting the affairs of the Ostrich Processing Industry. To collect and circulate market information and statistics. To secure coordinating action between of the Association, as well as to protect the interest of and/or render non-financial assistance to such members and to create goodwill and harmony amongst the members of the Association. To undertake the institution and/or defence of legal proceedings affecting the interests of the Association. To issue press statements on behalf of its members, relating to the industry and matters affecting it. To serve as a Forum for constant dialogue amongst its members and to promote dialogue between other members in the industry i.e. Producers. To raise or borrow money upon such terms and in such a manner and upon such securities as the Association shall deem fit and to secure the same or the repayment or performance of any debt, liability, contract or engagement incurred or entered in by the Association in any way and in particular by giving mortgages, charge or securities charged upon or over all or any of the Association's real and personal property (both present and future) and to purchase, pay off or redeem any such securities. To do all such other acts and things as the Association may consider incidental or conductive to the attainment of the above objects or any of them. No profits accruing to the Association may be distributed to any member. To promote public interest in ostrich products, especially meat, leather, finished products and feathers by way of advertising and marketing assistance. The members of the Association shall consider as members those persons, organizations, companies or other legal entities, whose business or involvement (activities) makes (requires) it necessary to keep in regular contact with the Association and its members and/or who have involvement in the purchasing, handling, manufacture, processing and marketing/sale of ostrich meat, leather, feathers and allied product. Members shall be entitled to amenities of the Association and to any statistical information that may from time to time be issued by the Association. Applications for full membership shall be made in writing, on the standard application form, seconded by two existing members, to the Executive Committee. Applications shall be considered at the first following meeting of the Executive Committee and the names of approved or rejected applications shall be laid before the first following meeting of the Association for information and final confirmation by the meeting. Each application will be considered on its merits and information submitted. The Executive Committee shall not be obliged to disclose the reasons for refusing membership to an applicant. Where there is ground or evidence of alleged disrepute of the Association and/or the South African ostrich industry the Association will have the power to terminate the membership of such member by a majority vote at any meeting of the Association. Before losing membership of the Association, erring members will be advised about his/her wrongdoing and given 21 days notice that his/her membership will be cancelled if a 2/3 majority at the propose meeting agree. He/she will have the opportunity to address the meeting on his actions. Members shall be entitled to receive annually, free of charge, a list containing the names and contact details of members. Members shall pay a subscription as determined by the Association from time to time and approved by an Annual General Meeting. All annual subscriptions shall be due and payable within 60 days of the 1st day of the financial year. Upon the insolvency, liquidation, winding up or dissolution of any member. 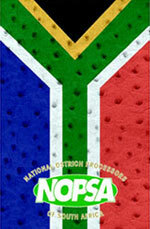 Members who do not pay due fees and levies within the required time period, or fail to abide by the constitution rules, regulations and by-laws, or otherwise bring NOPSA (the Association) or the South African ostrich industry into disrepute will loose membership and any rights and advantages which accompany membership. Before losing membership, the member challenged will be allowed to explain his action in writing to all members and address the meeting. When this action will be tabled, a majority of 66% is needed to confirm the termination. Any member may resign by giving the Chairman/Secretary of the Association written notice of his intention to do so. Where a member tender his resignation during the course of the Association's financial year, such member will not be entitled to proportional refunding of subscription or other fees paid. The affairs of the Association shall be managed by the members of the Association which are not hereby required to be exercised by the Association General Meeting and which may institute and/or defend any legal proceedings on behalf of the Association. Notwithstanding anything to the contrary herein contained, the Association shall not without a 2/3-majority vote of members expend in any financial year the funds of the Association in excess of the Associations income during that period. All Association decisions shall require a natural majority, except for those decisions that are specified and called for a 2/3 majority. The Chairman/Secretary shall have the power to open banking accounts on behalf of the Association and the Secretary together with the Chairman or a member nominated by the Executive Committee, shall sign all cheques requested by a requisition. The Association shall have the right to co-opt Technical Advisors. Minutes of all meetings, including Executive Committee or other sub-committee meetings, shall be circulated to all members of the Association as soon as conveniently possible but definitely latest together with the notice of the next members meeting. The Association will meet at least once a year. The members of the Association shall elect a Chairman and Vice Chairman and two additional members to form the Executive Committee, for one (1) year in the following manner. The Vice-Chairman shall be elected from amongst those representatives accepted and appointed at an Annual General Meeting. The two additional members will be the chairman of the Meat Committee and the Chairman of the Leather Committee. The Vice Chairman shall exercise the duties of the Chairman in the absence of the latter. If the position of Chairman becomes vacant through illness, death or any other reason, the Vice Chairman shall automatically fill the vacancy for the remainder of the term of office until such time that an election takes place at the following Executive Committee Meeting. The Executive Committee will elect a Secretary from amongst their own ranks or appoint a Secretary from an outside source. Market information and statistics will be collected, scrutinized and approved by the Executive Committee. Press statements will be issued, scrutinized and approved by the Press Committee on behalf of the Association, or if so requested on behalf of its members, relating to the industry and matters affecting it. Twenty one (21) clear days notice in writing specifying the place, the day, the hour of and the business proposed to be transacted thereat, shall be given when convening General Meetings and notice of such General Meetings shall be given to members of the Association. Want of service of the notice to any member shall not affect the validity of the meeting. Three (3) members of the Association may call Special General Meetings at shorter notice on a decision of the Chairman or upon a written request. No General Meeting shall be deemed properly constituted unless there be in attendance at least a natural majority of the total number of full members. A bare majority except may carry all proposals as otherwise herein provided. An Extraordinary General Meeting shall be called by the Secretary upon instructions of the Chairman, or upon a request signed by three (3) full members of the Association. At all General Meetings voting may be given in person or by proxy and the votes and acts of the proxy holder shall be as valid an effectual as if made done or given by the member in person. The Chairman shall ascertain that all proxies are valid and the Chairman shall inform the meeting about the number of proxies as well as the names of the members holding the proxies before any voting takes place. If any proxy is declared invalid, the Chairman shall disclose the reasons for invalidity to the meeting a forehand. All proxies must reach the chairman before the meeting and can be faxed, but must be signed by the member and be on his/her letterhead. Minutes of all General Meetings shall be circulated to all members as soon as conveniently possible but definitely latest together with the notice of the next General Meeting. The Annual General Meeting of the Association of which twenty one (21) days notice shall be given, shall take place within three (3) months of the end of each financial year. At such meetings, the Chairman shall deliver his report and the audited financial statements for the preceding year shall be presented and considered. At the Annual General Meeting the Chairman/Vice Chairman and Secretary and the Auditors shall be elected, the remuneration of the auditors shall be fixed and only further business of which due notice has been given shall be transacted. The Association in General meeting shall have the power from time to time to make rules and by-laws for the conduct of the Association's affairs, provided such rules, by-laws and conditions are not in conflict with this Constitution. The authority may in part or in whole be delegated to a working committee at the entire discretion of the Association in General Meeting of Special General Meeting. All rules and by-laws shall be approved by a General Meeting of the Association before such rules and by-laws will be in force and came into effect. A copy of this Constitution and of the rules and by-laws and of any additions or amendments thereto shall be supplied to each member. Failure to supply any member with aforementioned shall not invalidate any decision of a General Meeting. The members of the Association shall decide upon all questions relating to the interpretation of this Constitution. All such interpretations may be submitted to the next General Meeting for confirmation, rejection, amendment or appeal. In the event of a dispute, regarding the interpretation of the Constitution, the members in the meeting shall have the right to subject the matter to arbitration. The interpretation of the Arbiter shall be final. If upon winding up or dissolution of the Association, there remains after the satisfaction of all its debts and liabilities any property whatsoever, the same shall be realised and the proceeds thereof will be transferred to an association, company or society with similar objects. The Association may be wound up by resolution of not less than two thirds (2/3) of the members present at a Special General Meeting called for the purpose by the Chairman provided that as such meeting not less than the natural majority of the members of the Association are present or properly represented. The financial year shall be from the 1st day in July, up to and including the last day of June.